Osteoarthritis is a degenerative joint condition resulting from general wear-and-tear over time, with acute injuries and genetics also playing a role in the progression of osteoarthritis. While this form of arthritis can technically occur in any synovial joint of the body, it's especially common in the knees and hips, as these joint are subjected to the weight of the body under gravity, and when combined with impact forces from walking, running, or doing any physical activity, these joints become particularly vulnerable to degenerative conditions and acute injuries alike. Why does osteoarthritis cause pain and stiffness? What Does Osteoarthritis Look Like in a Scan? The progression of osteoarthritis differs across individuals. There are many different factors that can contribute to the development of osteoarthritis and we have provided these factors in a list below. As you can see, with the amount of factors, many of which are common occurrences, it's easy to see why osteoarthritis is so common. As we mentioned before, osteoarthritis is extremely common among the general population. It can be very debilitating, as it typically involves joint pain and stiffness, but it also has a huge impact on the health care system, adding to wait times for diagnostic imaging and leading to a massive financial burden on the health care system. If there is one silver lining to the financial burden, it's the the government has increased funding to researching osteoarthritis, which has led to a further understanding of the condition and ways to prevent and treat it. If you are curious about the difference between osteoarthritis and rheumatoid arthritis, check out this great video tutorial below. Inside your knee and hip joints, there is cartilage that lines the ends of the bones and allows for the dispersion of forces over a wider area, reducing the shock and impact of these forces on the bones. Furthermore, there is a fluid called synovial fluid that is found inside synovial joints. This fluid helps to keep the cartilage lubricated, which facilitates smooth and painless movement. When the cartilage begins to break down, this will create a more irregular surface, which will then begin to concentrate stress into specific areas, speeding up further break down of the cartilage. In the most severe cases of osteoarthritis, the cartilage wears down completely and you are left with bone-on-bone contact. This can be extremely painful and debilitating, especially in the hips and knees that are placed under your own body weight and accentuated by the force of gravity. The first step in diagnosing hip and knee osteoarthritis is being aware of your own progressing symptoms. These symptoms include stiffness in the joint, especially after the joint has been stationary for a long time, as well as pain, swelling and tenderness in the joint. In cases that have progressed for a little while, one may experience a crunchy or rubbing feeling, what may be self-interpreted as a sort of bone-on-bone feeling. With any of these symptoms, it's always a good idea to get checked out by a doctor, who may or may not refer you on to a physiotherapist or some other form of orthopedic specialist. Physical testing can involve testing the active and passive range of motion of the knee or hip joint, as well as looking for specific areas of pain and inflammation. In the process, other more acute injuries can be ruled out, but with a detailed history of symptoms, doctors can usually pinpoint osteoarthritis fairly quickly, especially since it is so common. In order to confirm the the diagnosis and the extent of your condition, you could eventually be referred for diagnostic imaging in the form of a ﻿﻿CT scan or MR﻿﻿I. CT uses X-rays, but is much more simple, quick, and affordable when compared with an MRI. That being said, an MRI, which does NOT involve the use of X-rays, is much more time consuming, expensive, technical, and usually involves long wait times to have a scan performed. Diagnostic imaging like this is usually performed in advanced cases of osteoarthritis, especially when a joint replacement may be in the discussion. As we just mentioned, there are a couple ways of diagnosing knee and hip osteoarthritis via medical imaging. The image below is an MRI scan of a knee with osteoarthritis, followed by a CT scan of a healthy and normal knee. The third image shows a comparison between the image quality of CT and MRI when attempting to diagnose hip and knee osteoarthritis. You can see the trade-off in this image. A CT scan is much easier to do, usually has a much shorter wait list, and is less expensive. However, for soft tissue like cartilage, MRI offers way better contrast, allowing us to deduce finer details in the anatomy of the knee or hip. The trade-off here is a more technically demanding procedure, high cost, and typically long wait lists. One of the reasons osteoarthritis can be so tricky, especially in the hip and knee, is because movement is actually beneficial for the joint. However, if you're really stiff and experience a significant amount of pain with movement, then this would obviously hinder you from wanting to get out and be active. In this sense, the progression of osteoarthritis is sometimes thought of as a positive feedback loop, in that the worse it gets, the less you want to move, and the less you move, the worse it gets! This is one of the main reasons why visiting a doctor sooner rather than later can be a good idea. This brings us to our main form of treatment, which is physical activity. This will serve to strengthen the joint overall, taking some of the load off the cartilage, and also helps to keep the joint surfaces lubricated and moving as best as possible. An analogy is a rusty door hinge. If it's left a really long time in a stationary position, it will be difficult to move, likely squeaking in the process. However, if you keep moving it gently every day, it will gradually loosen up with time. So how can you keep moving without experiencing debilitating pain? Some doctors suggest pain medication and anti-inflammatory drugs, even something is simple as Tylenol and Advil. This can help keep the pain at bay while you perform some gentle exercise. Other things like knee braces for osteoarthritis can help as well. These knee braces are different than braces for ligament tears, and are usually more simple. They tend to be slimmer in design and offer compression and therapeutic warmth. These braces can usually be worn all day, allowing you to go about your normal daily activities while experiencing a reduction in pain. At the same time, exercise can serve to cut down on unnecessary body weight, which itself is a risk factor for the development of osteoarthritis. Don't worry though, if you're a larger individual and worried about not having the additional support of a brace, there are lots of affordable plus size knee braces available for this very reason. In this sense, exercise is a treatment that can address multiple risk factors while treating the condition at hand, so it shouldn't be overlooked. Even if something like walking is painful, other activities can be just as helpful, such as swimming, which essentially removes any impact forces that you would experience during walking or running, or even cycling. There are several supplements that may be worthwhile taking to help reduce Osteoarthritis. Glucosamine and Chondroitin Sulfate have been shown in studies to positively impact those suffering from arthritis which can lead to reduced pain and improved mobility. Turmeric, which contains Curcumin is also another joint supplement that has shown to have a positive impact in various studies. It can help reduce inflammation which of course is one of the root causes of pain and general lack of mobility. Generally, most joint supplements are often good bets. Of course, not every joint supplement which claims to help with joint pain have been through thorough, lab testing and research. 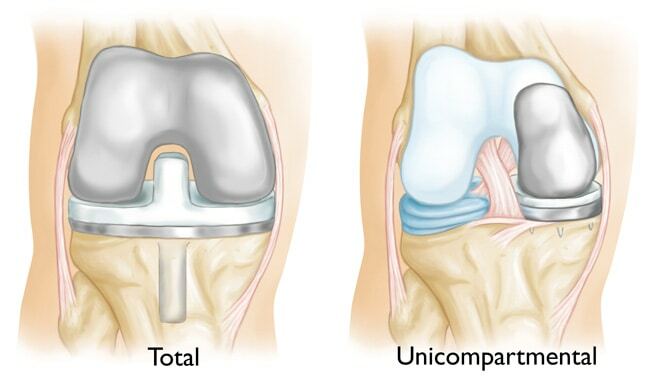 Surgical procedures for advanced knee and hip osteoarthritis typically involves partial or total joint replacement. This usually involves replacing the cartilage and surface of the affected bone with a synthetic material like polyethylene or metal. These types of joint replacements can make a huge difference in pain and stiffness for the better, but the material in these types of replacements isn't invincible, and usually needs to be replaced again at some point. We mentioned early that one silver lining to the high prevalence of osteoarthritis is the increased funding towards research in this domain. This has allowed for a lot of research to be conducted regarding the underlying mechanisms and treatment of osteoarthritis. One study that I was personally involved in conducting investigated the effects of different strengthening and stretching programs for hip and knee osteoarthritis, with the primary outcome being reported levels of pain and stiffness in these joints following the programs. Lots of people were involved in this study, from young to old, and generally speaking, we saw great results in terms of pain reduction following these exercise and stretching programs. This type of research is one of the more applied forms of research. On the other end of the spectrum, we have basic research, which really gets into the underpinning mechanisms of osteoarthritis. An example of this type of research is the study of various proteins, such as proteoglycan-4 (PRG-4), which has been shown to be highly involved in the progression of osteoarthritis. While this type of research doesn't really lead to improved treatment right away, it furthers our fundamental understanding of biochemical and physiological aspects of osteoarthritis. In turn, this will lead to different and improved treatment protocols, perhaps even making use of the body's own constituents, such as stem cells. Lastly, as technology improves and research continues, diagnostic imaging and surgical procedures are continually improving. The use of better bio-compatible materials, better devices for joint replacement, and improved medical imaging are all ways we can improve our understanding and treatment of hip and knee osteoarthritis. Osteoarthritis is an extremely common degenerative condition, but that doesn't mean one simple has to live with it. There are many ways to treat osteoarthritis, much of which will improve other aspects of your health as well. The first step is keeping track of your symptoms, and of course, visiting your doctor. Once you have completed this step, you're well on your way to developing a personalized plan to get back to your old self. Good luck!